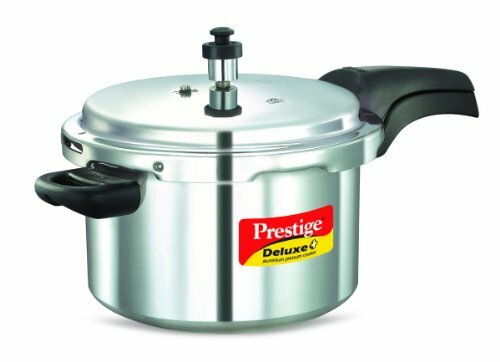 The Prestige Deluxe 5-liter Aluminum Pressure Cooker PRDAL5 is a perfect pressure cooker. Prestige cookware has been around for more than 50 years. When you invest in one of their pieces, you’re buying a tool that will last for years. If you’ve never used a pressure cooker, or if you’ve heard the horror stories about them, you’re in for a treat. The world of pressure cooking has changed a lot. With just a bit of study, you can learn to use one of these safe and effective tools. You’ll enjoy great food with terrific flavor, and more time living instead of cooking! The 5-liter Prestige pressure cooker is on the smaller end of pressure cookers available in the market place. Depending on the size of your household, this can be a real bonus. Model PRDAL5 is well built with a heavy bottom, and weighs over 5 pounds. This is a critical factor in preventing scorching. In the past, pressure cookers were a worrisome tool. Pressure cooker explosions were not uncommon, and these were messy, dangerous events. New features included on the PRDAL5 include release valves and a metallic safety plug, so the risk of explosion is minimal. However, there is a learning curve to working with a pressure cooker. Because you are cooking under extreme heat and pressure, your food will cook much faster. Pressurization can take between 5 and 8 minutes, but once pressure is achieved, pressure cookers are much faster than microwaves. Pressure cookers work as a sealed unit, so your food will be much more flavorful than food cooked in an ordinary fashion. The nutritional loss by the boiling process will also be reduced. The time savings that can be reached once you know how to use your pressure cooker cannot be overstated. In today’s busy world, the thought of putting together a meal at the end of the day can be more stress than people can handle. With just a bit of preparation, you can be ready to load food into your pressure cooker and put together a quick, flavorful meal in under thirty minutes. It may take time to become comfortable with pressure cooking, but it’s a skill that can make your life a lot easier. Using a pressure cooker can also help your budget. While it can be a challenge to draw good flavor out of cheaper cuts of meat with regular cooking methods, pressure cooking stew meat is a great way to enjoy the terrific flavor and a lower grocery bill. If you’ve never cooked with dried beans because the timing is a challenge, a pressure cooker will remove that challenge. Not only can you enjoy the basics such as black, bean and pinto, but many Asian specialty shops offer a wide variety of beans never available in a can. Each flavor is unique. This heart healthy, protein rich food can be easily and deliciously prepared in a pressure cooker. A “full” pressure cooker more is 2/3 full. Do not overfill. Heat on high until full pressure is reached. Model PRDAL5 has a Pi Pressure Indicator that will let you know when the cooker is pressurized. Your cooking time starts at this point. When your cooking time is reached, remove the pressure cooker from heat. If it’s still pressurized, it’s still cooking. Never open a cooker under pressure or force the handles apart. First off, this will be extremely difficult. Secondly, you will be injured. Release steam by the safety valve, or run the cooker under cook water until the pressure is reduced. Open the lid away from you so you are not exposed to hot steam. There are foods that should not be cooked in a pressure cooker. Anything that is prone to sputtering or splashing may clog the valves and make cleanup difficult. White rice and certain grains should not be cooked in your pressure cooker. Investing in a Prestige PRDAL5 could remind you all over again just how much fun it is to cook. This is a safe and effective tool for your kitchen, backed up by five decades of experience in cookware creation. Enjoy!